Windemere condominium at Sawgrass in Ponte Vedra Beach, Florida. 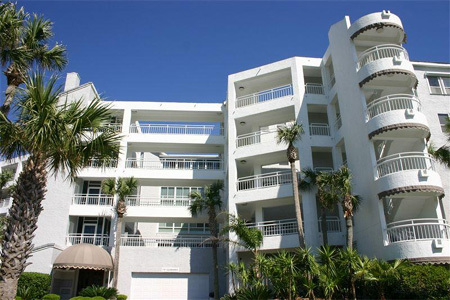 Windemere is a luxury oceanfront condominium in beautiful Ponte Vedra Beach within one of the most picturesque and smartly developed gated, residential communities along the coast. Sawgrass community is situated on 1,250 acres adjacent to the Atlantic Ocean. While enjoying the beauty and benefits of a northeastern Florida barrier island, the community is just 20 minutes to the southeast of Jacksonville, the site of Super Bowl XXXIX, and just 20 minutes to the northeast of St. Augustine, the country's oldest city. Sawgrass Country Club features 27 holes of championship golf, designed by Ed Seay of Palmer Course Design. It is consistently ranked in the top 100 courses to play and among the "Best in State" by Golf Digest. Sawgrass gains its reputation as the home of The Players Championship of The PGA Tour. The Sawgrass Racquet Club has been awarded World Tennis magazine's "Five Star" tennis destination and has ranked it among the nation's 50 best by Tennis magazine. Sawgrass has 13 Har-Tru clay tennis courts with a full service pro shop. The clubhouse provides locker rooms, a card room, and other amenities. The fully equipped health and fitness center includes a heated pool. There is a complete suite of dining options, including overlooking the Atlantic Ocean at the private beach club with the pool. Surrounding the Stadium and Valley courses are some of the most desirable addresses and magnificent homes in Northeast Florida. Sawgrass is a private member-owned Equity Club uniquely combining golf, tennis, dining, fitness, recreational and oceanfront beach facilities for the benefit and enjoyment of its members, their families and guests. Sawgrass has many home opportunities with resales available for executive homes, patio homes, townhomes, and condominiums. Call me today at (904) 307-8998 for availability and schedule a tour.